I’m liking my new toy! Wednesday, I got my NOOKcolor at my local Barnes & Noble, and I’ve been having fun with it. I’d been waiting for an eReader to come out with color. A necessity for truly experiencing magazines, graphic novels, or even picture books. 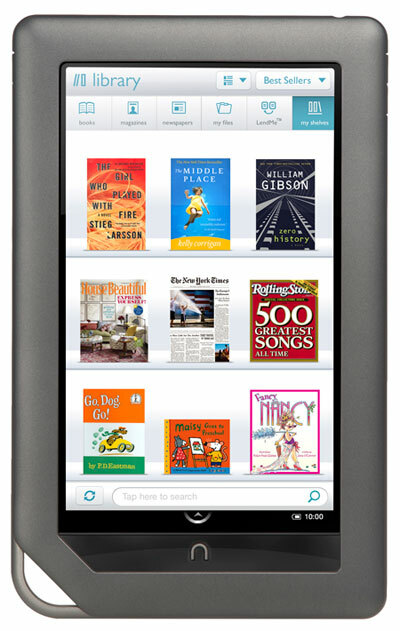 I also like the extras that come with the Nook. You can search the web. There are games, like Chess, Sudoku, and Crosswords. And you can upload images to the gallery and your tunes to use it as an MP3 player. I imagine being able to play movies is not too far off on the horizon either. I found the learning curve very easy, especially considering this is the first touch screen device I’ve owned. Typing and selecting buttons on the screen is easier than I expected, too. The screen images and text are crisp, and the video and audio are excellent as well. Added features, like games and MP3 capabilities, are a great bonus. What’s the first book I purchased? Agatha Christie’s Secret Notebooks: Fifty Years of Mysteries in the Making. As a mystery writer, I thought it would be great to get some insight into how one of my favorite authors plotted her stories and came up with her ideas. Plus, the search function of the Nook will make it easy to access sections I might want to refer back to for inspiration. It’s also a great way to find quotes from classic literature. As a side note, I may not be the world’s greatest Chess player, but the Nook is brutal! I’ve played other Chess games online and elsewhere, and I don’t recall normal settings being as tough to beat as the Nook’s easy setting. What’s up with that? The AI is way too sophisticated. I’ve managed to beat it a few times, but really, a child would be in tears trying to beat that thing. The only other drawback is keeping the screen clear of fingerprint smudges. No doubt the bane of touch screen users everywhere. Although I understand B&N has kits to protect the screen. Something to look into. The Nookcolor currently retails for $249, but factoring in tax–and most will want to pick up a case to put it in–this new gadget will run you just over $300.